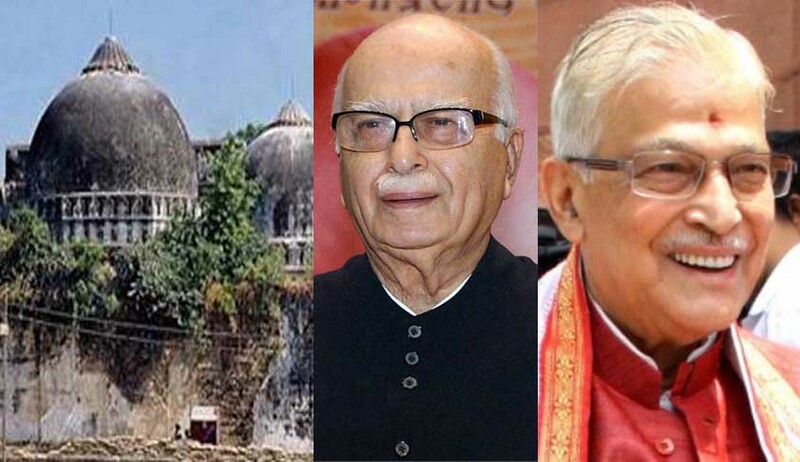 The Supreme Court on Thursday reserved order on CBI's appeal to restore criminal conspiracy charges against BJP leaders including senior BJP leader L K Advani and 20 others in the Babri Masjid demolition case. A bench of justices P C Ghosh and Rohington Nariman reserved the order after hearing the day-long argument from the counsel for CBI, Advani and Murli Manohar Joshi's counsel and others. The parties were asked to file their written submissions by Tuesday. Arguing for CBI, Additional Solicitor General N K Kaul argued that the order of Allahabad High Court should be set aside and the criminal conspiracy charges against the accused persons for their speech provoking the Karsevaks should be restored. He said there are two FIRs 197/ 1992 (demolition of the structure) and trial is pending before the special court of Lucknow and FIR 198/ 1992 (provocative speech by the political leaders) is pending before a court in Rae Bareli in Uttar Pradesh. To his argument, Justice Nariman asked "assume that the charges were restored. What about the technical glitch due to which the charges were dropped." Kaul said all accused should face trial under FIR 197/92 which is pending before a special court where the larger aspect of conspiracy to demolish the structure is pending and the order discharging the political leaders should be set aside. The bench, which has noted the sequence of events since December 1992 , asked Kaul "what is the practical effect, once the conspiracy charges are restored." Senior Advocate suggested the trial has to start afresh in the court where more than 100 witnesses are yet to be examined. The bench has indicated to transfer the case from Rae Bareli to Lucknow. "What we propose is the matter can be transferred to Lucknow. Both the cases go on together. We can order for day-to-day hearing and order to complete the trial in two years," the bench suggested. During arguments by CBI counsel and his reference to voluminous documents, Justice Nariman expressed his anguish over delay of trial for more than two decades due to technical glitches. “Due to confusion and voluminous documents, it is difficult for us to pass any judgment ,” Justice Nariman said. Appearing for Advani and Joshi, senior advocate K K Venugopal raised objection to the court’s suggestion for revival of conspiracy charges and also the shifting of case to Lucknow court. The court was also hearing a separate petition filed by one Haji Mahboob Ahmad, President of Mahafiz-Masjid-Wa-Maqabir’ and Muddai BabriMasjid which claimed that with the BJP regime and a “participant” Rajnath Singh as Home Minister, CBI, the original petitioner against dropping of criminal conspiracy charges may not press for its restoration. At the outset, Venugopal said “the clock can’t be set back. He questioned the jurisdiction of Lucknow court to try FIR 198/92. Further, he said there is nothing to show that conspiracy was hatched by the accused persons. “If the defect is not cleared by the state , we can intervene. That’s why we step in,” Justice Nariman said. Opposing the court’s view, the senior counsel Venugopal said this will violate the fundamental rights of the persons involved in the case. He tried to persuade the bench that the Lucknow court is a sessions court and Rae bareli court is of a first class judicial magistrate. If the case will be transferred, his client will loose his one right to appeal in Lucknow, he said adding Article 142 can’t be the source of unlimited power referring to several judgments of the Apex Court. Justice Kuldeep Singh had passed several orders exercising the power under Article 142 for protection of monument, environment etc but not but in this case the stand of the court would be directly in conflict with the rights of an individual under Article 21 (right to life). It had also hinted that it would club the two separate hearings going on in Rae Bareli and Lucknow courts. CBI had charge sheeted Advani and 20 others under sections 153A (promoting enmity between classes), 153B (imputations, assertions prejudicial to national integration) and 505 (false statements, rumours etc.circulated with the intent to cause mutiny or disturb public peace) of the IPC. It had subsequently added charges under section 120B (criminal conspiracy) of IPC which was quashed by the special court whose decision was upheld by the Allahabad High Court.